Chaplin may have indeed been the greatest British film director of all time. From working on his films set design and script, to scoring his own music and directing. He almost single-handedly created these wonderful films in his own way. As with most famous people, it was sometimes his personal life that the media were more concerned about. Chaplin was a very complicated man, and often felt like an outcast or that he was alienated from the rest of the film industry. 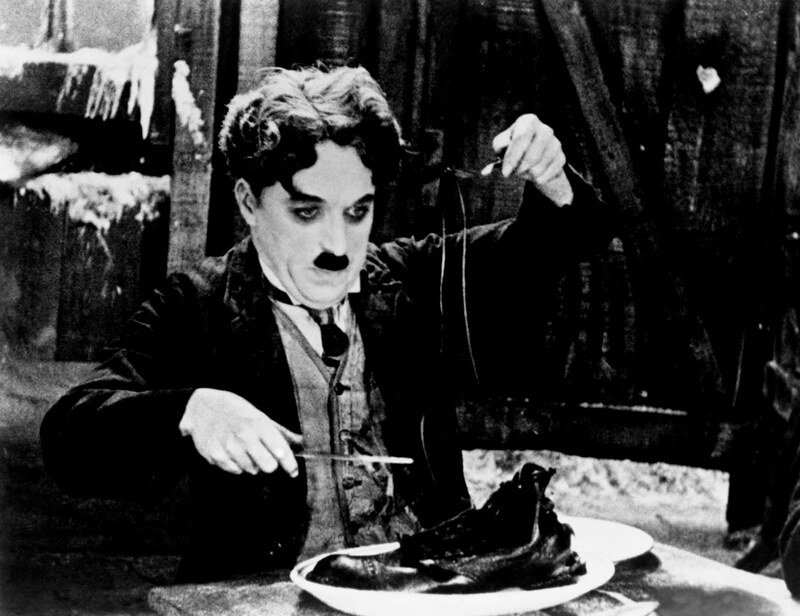 These personal emotions come across in his films often, but perhaps none more so than in The Gold Rush, Chaplin’s most celebrated silent film. It is easy to personally connect with Chaplin’s new version of the “Little Tramp”. Here, he has become “The Lone Prospector” he looks as the Little Tramp did, but is perhaps even more at conflict with the world that surrounds him. He seems extremely disconnected, often causing himself more trouble by trying to make things better. The Prospector seems alone as a silent character, in a new chaotic talkie world. He seems to want to keep things basic, existing in an environment where everyone else is constantly progressing forward, and becoming more complex. Most interestingly, the character seems weak, and is much smaller in stature than most of the other characters. He is constantly being made fun of and thrown about by stronger people. Even the girl he has fallen in love with sees him as a joke for much of the film. Never before has a Chaplin character seemed so out-of-place in this world. Perhaps the Prospector was the closest character to his real life persona that Chaplin ever brought to screen. One of the elements that make the film so great is its comedy, particularly in the mixing of comedy and tragedy. Certain parts of The Gold Rush are extremely tragic. One part involving characters becoming so hungry that they are not far from starving to death, involves a mix of very dark undertones. However, Chaplin manages to turn these situations on their heads. Normally, witnessing two people become so hungry that they resort to eating a boot would be desperate and sad to see. 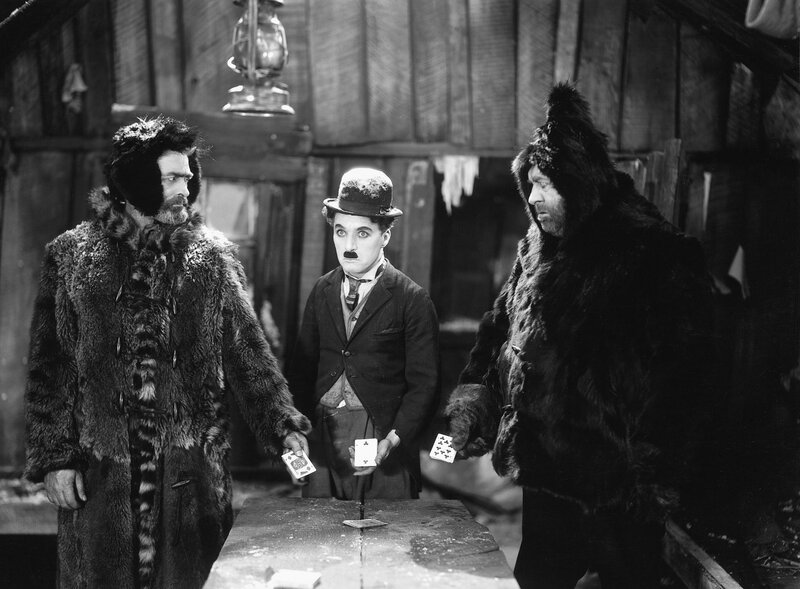 Witnessing the Prospector and his fellow gold hunter “Big Jim” do this, becomes extremely comical; not because of the situation, but because of how Chaplin plays the scene and sets it up. How he cooks the boot as if it were a nice piece of fish, complete with the bottom soul as skin, and the nails of the boot as bones. It is often hard to explain Chaplin set pieces in words. They never seem as great or as funny as they are on-screen, particularly to audiences today. The comedy is placed in the truly wonderful physical performances and their precise sense of timing. Take for example a scene in which “Big Jim” and “Black Larsen” fight over a gun. The Prospector desperately tries to move out-of-the-way of these big, angry men as they fight. Of course, everywhere he moves the barrel of the gun follows him around the room, always pointed at the Prospector, even though this fight does not concern him. This theme continues throughout the film, the character seems to become so involved with all situations, even when the only thing he is trying to do is desperately avoid them. The Prospector is also faced with false hope on many occasions; especially when it comes to the girl he has fallen in love with, “Georgia”. Who at first, seems to tease the Prospector, using him as a tool to make other men jealous. She at one point starts to laugh at the idea that he could ever love her, and even stands him up on New Years Eve after she promises to see him. Georgia is a strange character in the sense that she herself is unaware of her own goals. She goes from liking other men, to hating them, and from teasing the Prospector, to wanting to apologise and love him. She is floored as a character, and at times seems unnaturally quick to make huge decisions about her life. However, this does not hurt the film. Chaplin was still able to make the ideas surrounding Georgia work as a living character – not a massively fleshed out one, but one that still works well regardless. In the final stages of the film, the Prospector finally gets himself into a good situation by chance. His old friend “Big Jim” is placed in a position to make them both very rich. This comes as a shock at first, but Chaplin shows with his character that good people will, in the end, succeed. As long as their heart and soul are in the right place. This concept may seem too simple or even slightly corny to modern audiences. But the film ends up not only being funny and thought-provoking, but heart warming, and has something that many films today lack – a soul. The Gold Rush will surely remain a classic until the end. 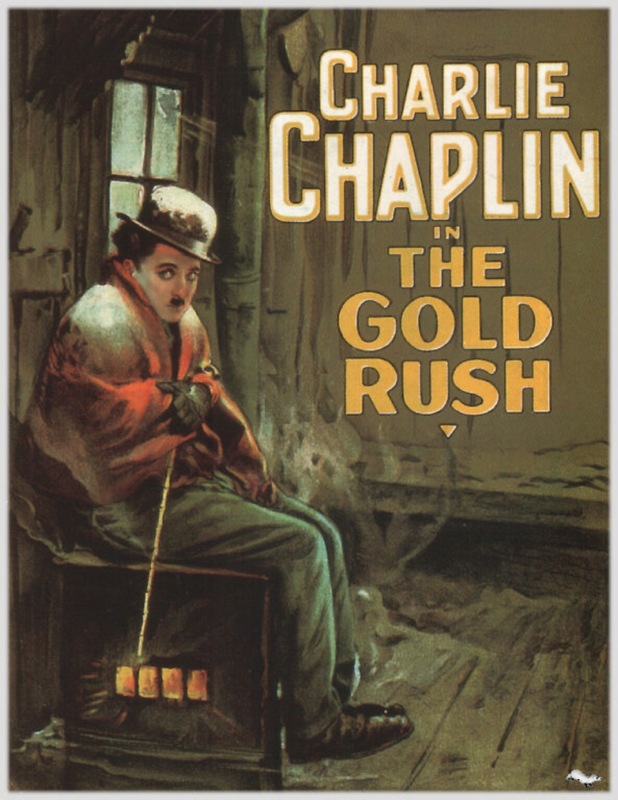 If you are ever wondering which Chaplin films you should seek out, you can do none better than The Gold Rush. The film is full of cold snow, but if you let it, the story is sure to warm your heart. Hi Darrell. A very good appraisal of this Chaplin classic indeed. I agree with most of what you say, though I would not personally hail Chaplin as the ‘greatest’ British film director, but that is all subjective, after all. The scene where he eats the boot, is an undoubted classic, possibly never bettered, both for pathos, and comedy, at the same time. In the age of modern films, gems like this are often overlooked, so you have done justice to the film with this review, and hopefully introduced it to a new audience too. Great review, I’ve seen The Great Dictator and Modern Times. I have been wondering which to watch next and I think I have been convinced! I’ll add it to my top 10 watch in Jan right now! Great. I’m very glad you will. It is indeed a great great film. Great new site I’ve discovered. Thought readers of my site would be interested. Fantastic Review. I saw this a few years ago and it really stuck with me. I think it definitely goes with modern times in our need to get rich quickly and the boot scene was hilarious. I’ve always admired how Chaplin so deeply believes in what he is doing with his characters that he does some insightful work as an artist. As for films today not having a soul I believe that it depends on the individual film. There were a lot of crappy films made in the silent era and golden age of cinema probably the same amount as what is made today. The difference in what we remember today and what we will remember tomorrow is that ability to guide us all to something greater within ourselves. That “it” factor is one you can’t market, can’t distribute, can’t copy as it lies within all of us. Chaplin certainly understood that and brought it to fruition in all of his films. Great review. Though it isn’t among my favorite Chaplin movies such as The Great Dictator, City Lights, Modern Times, & Monsieur Verdoux, nobody can deny why so many regard this film as a bonafide classic. You’ve given this film the fitting review it deserves. Thank you so much. It is my favourite film of all time. So I wanted to and give it the attention it deserves. Scene where he has to eat his shoe? Classic, loved it. Hi Darrell, I might be seeing double, but this popped up in my reader today as a ‘new post’. I thought it was from January, did I miss something? Hi Pete. I will be updating some old posts in the next few days. Due to the flow and some grammar things. But also in an attempt to make them better. No problem Darrell, as long as I’m not seeing things!